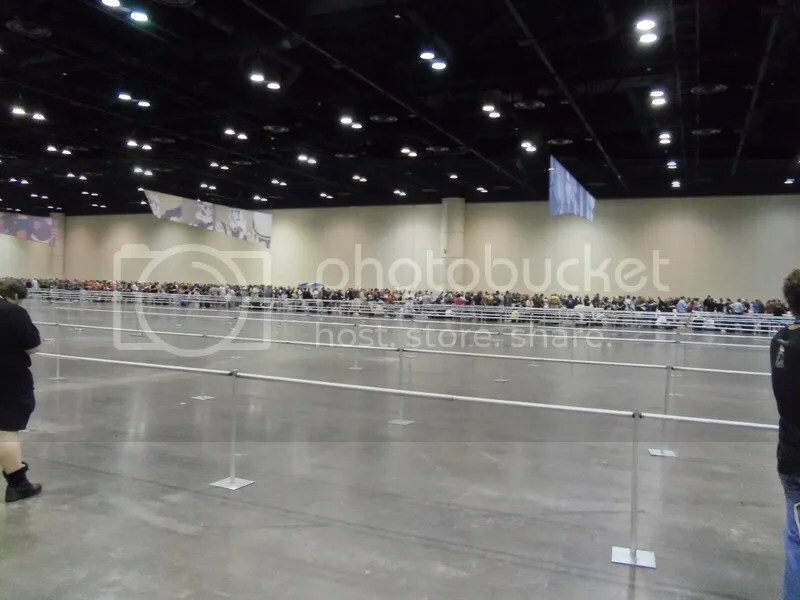 So what’s it like at Star Wars Celebration VI? Well, let’s start with the line. First off, I had no intention of getting up at the break of dawn to camp out in line. However I did show up an hour and a half early and it worked out pretty good. I certainly wasn’t at the front of the line, but I was pretty close. The wait wasn’t too bad since I brought a book (and I’m really enjoying Christie Golden’s Fable novel) and every now and then a costumed attendee would walk by for photos. Once the proverbial gates were opened and the drooling Star Wars fans charged into the convention floor, I immediately realized I didn’t really know where I wanted to go first. The publisher tables? The vendors? So I cautiously avoided the mobs surrounding the vendor tables and circled around. I spotted some cool dioramas, the Celebration Store, the Lego area, and eventually wound up in line for Dave Dorman. Dave is a legendary Star Wars artist (hey, when George Lucas has your paintings hanging up on his walls, you’re indeed legendary). I had already pre-ordered my exclusive Star Wars Celebration VI print from Dave, so I figured I’d knock that off the list first. While there I said hi to another Star Wars artist, Joe Corroney, I saw Jan Duursema, and Drew Baker. All three of them were stationed around Dave’s table. When I arrived at Drew’s table, he was actually talking with Leland Chee, which was pretty cool. Drew was one of the artist for Star Wars: The Essential Guide to Warfare. Let me just say that in person, Drew’s original paintings are absolutely stunning. Some of the colors are so bright that I thought they had LED lighting on them. It was amazing. Of course the price tags were amazing too, and sadly way too expensive for me (these were the originals after all). Anyways, I had plenty of time to drool over Drew’s artwork as I had to wait in Dave’s line for an hour. The reason? Dave took the time to draw a small sketch on each print, free of charge. So when I wasn’t drooling over Drew’s artwork (and wondering if I could somehow justify spending $3,000 on a beautiful painting of Abeloth fighting Sith and Jedi), I was thinking about what I would ask Dave to drawn. 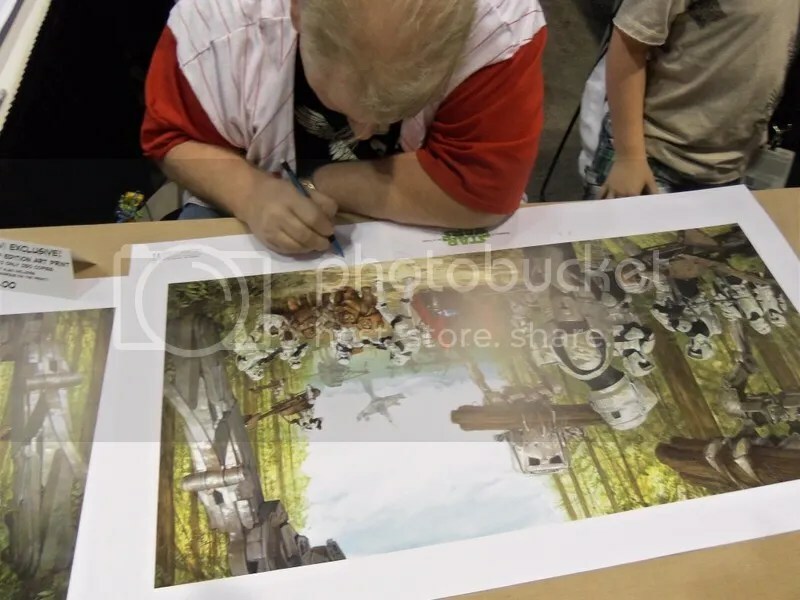 It’s an Endor print, so it should have something Endory. Well…it would have to be an Ewok. But hey, why make it easy? Finally I got to the front of the line. The moment in history: Dave Dorman as he doodles Tarfang. Time was cutting it close as I had an interview with author Drew Karpyshyn…pretty much right now…so I scrambled over to the Del Rey booth and talked with Frank Parisi and Drew. We considered doing the interview right there in front of the Scoundrel‘s lineup, but Drew thought it would be too loud (probably a good call), so we headed up stairs to quiet area. What did we talk about? Oh, a little bit about Annihilation, Revan, Children of Fire, and lots of other very cool stuff. Stay tuned for our full transcript of the interview (and maybe even a youtube video with the audio). For now, let me just say that Drew gave some pretty cool details about the characters. From there I headed off to the Dark Horse panel. Now according to the name of the panel, it was suppose to be looking ahead to 2013, however Dark Horse Comics editor Randy Stradley very quickly stated that the big announcements would happen at New York Comic Con and maybe afterwards. However, they did reveal some new info. For instance Dark Times will be getting two more arcs. The next one will feature K’Kruhk and will detail his escape from the planet with the orphans and how they end up crash landing somewhere else. 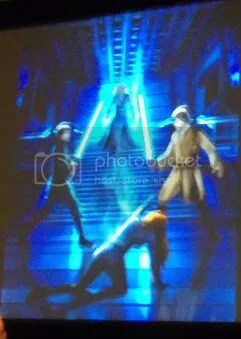 It will also highlight Vader training the assassin Falco. I believe Randy said the arc would be called Fire Carrier. This will ultimately be a hold over for the next arc which according to Randy Stradley and Doug Wheatley, is the point they’ve all been working toward. Doug will only be doing the covers for the next arc (with K’Kruhk) because he has some very special, ultra secret project he’ll be working on. Doug will be back for the interior art in the arc after that. No new arc were announced for Knight Errant, Lost Tribe, or Knights of the Old Republic. In fact there were no new projects announced for John at all (hopefully that will be one of the NYCC announcements). Aside from Dark Times, Randy did shed a little light on Agent of the Empire: Hard Targets. We’ll be seeing Boba Fett, Winter, and Darth Vader cameos, the Count Dooku is not the Count Dooku but the current Count Dooku, who will also be assassinated and kick off a conflict over succession where Jahan Cross will have to choose a side (one of the successors being a small child). There will be a new mini-series for Purge (which was originally just standalones). It will be called Purge: Tyrant’s Fist, Alexander Freed will be writing it, and Marc Castello (from Knight Errant: Escape) will be doing the artwork. It will take place on a primitive planet were the inhabitants consider the Jedi to be mythic figures. The new series simply title Star Wars was touched on a little. It was said that Wedge and Mon Mothma would both be getting some big roles. Randy re-emphasized that this is not a reboot and they will not be trampling continuity. Dave Marshall also emphasized that due to when this is taking place, it will be a great point for new readers to enter into Star Wars comics. During the Q&A session, someone asked about Invasion, and it was noted that Invasion was put on hold because Colin Wilson was available to do the artwork. Hopefully that means they’ll come back to it eventually. Another mention was that Dark Horse and Del Rey are working on a collaborative project where one side will tell part of the story, and then the other side will tell the rest. Very vague but still promising and something to look forward to. There will be two more omnibuses next year, Unknown Regions and Wildspace, that will be collecting obscure comics such as some of the UK and black and white stuff. Those will be out late next year. Next was my interview with Troy Denning, which turned out great. I covered a lot of ground with Troy, from Crucible to The Sentinel, from Squibs to Hapans. Like the Karpyshyn interview, look forward to seeing more of the in the immediate future (probably next week). After wandering around a bit, I ended up at the Timothy Zahn Retrospective panel hosted by Pablo Hidalgo. Pablo walked Tim through all of his Star Wars stories (including his stories for Adventure Journal and Insider) up to Scoundrels. Zahn talked about some interesting things. For instance he saw Karrde as Avon in Black 7, he drew upon some Star Tours stuff for the Hand of Thrawn duology, was offered books in the NJO but turned them down because he preferred to do something with more freedom, recounted his first encounter with the 501st (which involved Klingons bringing can openers to poke fun at the stormtroopers, who then retaliated by wearing lobster bibs). Troy also mentioned that he had started Outbound Flight, shelved it, then did Survivor’s Quest and came back to Outbound Flight, which allowed him to do both outlines together. The idea for Allegiance was sparked from a conversation he had with 501st Legion founder Albin Johnson. As for Scoundrels, they didn’t say much, but Tim did say they had initially wanted to call it Solo’s 11 but weren’t sure if they could get away with it. The last panel I was able to attend was Secrets of the Chiss hosted by Ryder Windham. Now I’ve never read any of this books or comics about the young Chiss Jedi named Nuru, but the panel was very interesting. Ryder isn’t like most authors, and he approaches writing very differently. He described himself as a mechanic. People ask “Can you work on this?”, Ryder: “When do you need it by?” He pointed out some of the strange requests he gets from Lucasfilm and Dark Horse, such as them wanted to squeeze in the Malevolence from The Clone Wars (when it didn’t fit into the story at all) or a commando droid who wants to be a Jedi (which is probably the strangest request I’ve ever heard). A few things that struck me as odd is that Ryder doesn’t often request to do any particular stories. Usually the publishers come to him and ask him to do something. Secret Missions, however, was something he wanted to do. Later on he reached out to Randy Stradley about doing the Secret Missions comic book. Ryder said he doesn’t normally come up with stories he would like to tell, so Secret Missions was very different in that this was a story he did want to tell. When writing, the ending is the most important thing for him. He said he couldn’t imagine trying to write a story if he didn’t know what the ending would be. For him, the ending is like a dart board and it gives him something to aim at. It’s typically the first thing he does: figure out the ending. He also said that he’s more of an idea person than a storyteller. He comes up with ideas and more or less manipulates them into a story. When it comes to characters, Ryder said he prefers existing characters rather than creating new ones. He likes how it all ties into continuity that way. He reveal that Nuru is actually Spiker, and that this is something he and Leland Chee have worked out, though the story hasn’t been written yet. Sadly there aren’t any plans right now to continue that story. There are some future projects in the works though. One is a Boba Fett novel for Scholastic that is on the shelf (pending release), there’s a new Haine’s manual on a vehicle, and a bounty hunter project for Brecker and Meyer. Well that will have to do for now. I’ve got lots of pictures but I won’t be able to post them all now, so keep an eye out for more posts (probably next week) showing off a lot of the sights. Thank you for sharing this! I’ve been looking for someone who attended Mr Windham’s panel. I’ve always liked Spiker even though he is a minor character and this would give him a very interesting backstory indeed! Had the people at panel read the old Spiker and Big Gizz comics? There weren’t many (if any) questions from the audience on the old Spiker and Gizz comics, but Ryder talked about them quite extensively at the panel. He said Killian really liked drawing Big Gizz and Spiker, which is why they came back to life after their comic deaths, and later on Ryder talked with Killian about how maybe Nuru could be Spiker. Nevertheless I always enjoyed the Spiker & Gizz comics and I think it’s great that at least some authors pay attention to minor characters like them.